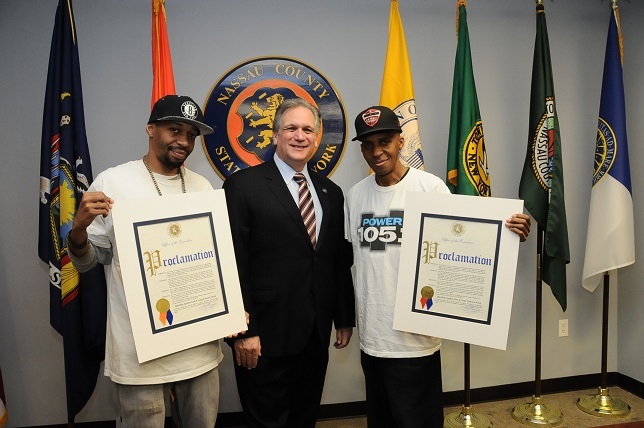 Monday June 8, 2015—-In recognition of the 4th annual Hip-Hop Against Gun & Gang Violence Week (May 15-21, 2015) and to further support Gun Violence Awareness Month (June) we kicked off a 105-day Campaign to produce 105 events over 105 days with Power 105.1, the Source Magazine, metroPCS, “The Shark” Daymond John” and the NY Code + Design Academy to end Gun & Gang Violence with a focus on the hot summer months when gun violence spikes. This is a very special year because in addition to the Proclamations/Resolutions from NYS Governor Cuomo, the NYS Senate and Assembly; NYC Mayor de Blasio; the NYC Council, Nassau County Executive Edward Mangano, we were blessed with a Powerful and “Inspirational Message from President Barack Obama”, who recognized our outstanding work to end gun and gang violence. 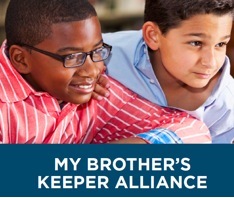 The President recently launched the My Brother’s Keeper Alliance and we have partnered with the organization to address issues around education, employment, entrepreneurship, the digital divide, crime and youth empowerment for young Black & Latino males. The week started with a pre-event on the 14th at the headquarters of South by Southwest News where we attended an event with Ambassador Carlos Garcia to discuss global gang issues. We signed an MOU with the Solutions Group from El Salvador to help address a growing gang problem in America and El Salvador caused by the violent MS 13, one of the most violent gangs in the world. On the 16th we coordinated the Young Men’s Hip-Hop Empowerment Summit with the New York City Mission Society at the Minisnk Townhouse in Harlem where we were joined by Councilmember Inez Dickens who applauded the campaign for its continued commitment to end gun and gang violence, while providing the necessary resources for those looking for a better life. 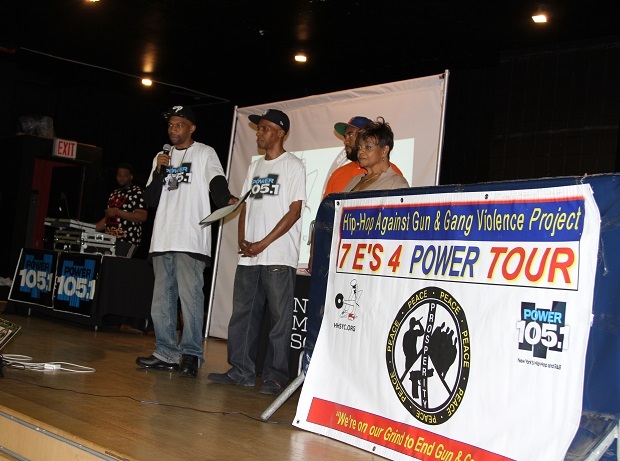 The event was a success as members from the audience came forward to offer their solutions to end gun and gang violence, which will be presented to Celebrities, Power 105.1, Political, Business and Community leaders for possible implementation. HSYC with Council Member Inez Dickens and Troy Outlaw from her office. Participants also learned about the history of Hip-Hop and how to use the Cultural and Spiritual element that created the “Raptivism Movement” to end gun and gang violence. “In God We Trust” is the slogan on all US Currency and if people really want to get “Paid in Full” all they have to do is learn how to “Trust In God.” We will show young citizens how to get rich and “Not Die Trying” through spiritual enlightenment. 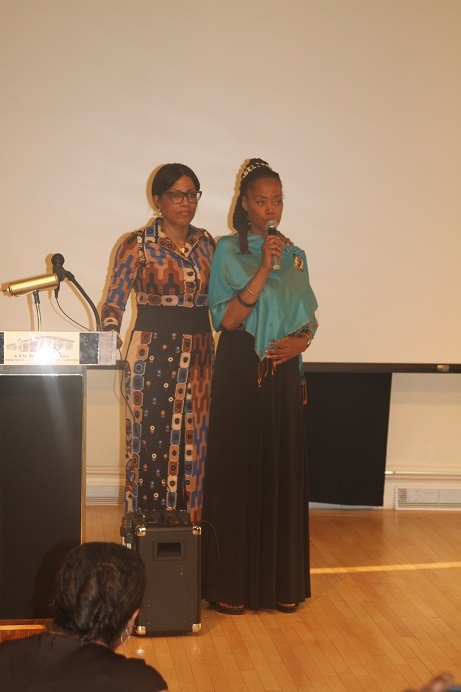 Malcolm X’s daughters Ilyasah and Gamilah Shabazz at Malcolm’s 90th Birthday celebration in Harlem. To address Black on Black Crime on May 19th, we read the President’s Message during the 90th year birthday celebration of Malcolm X at the Audubon Ballroom in Harlem where he was killed. Speakers paid respect to Malcolm and offered solutions to end the Black on Black Crime in memory of a man who fought to improve the life of poor citizens. In NYC Black & Latino’s make up 97% of gun shooters and 96% of those murdered by a gun. 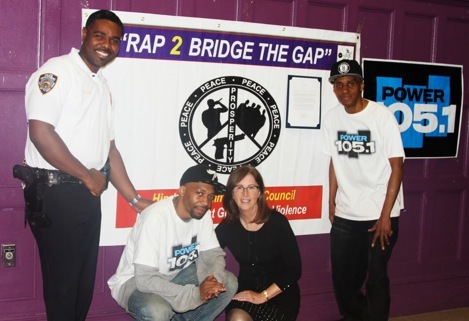 To closeout Hip-Hop Against Gun & Gang Violence Week we kicked off the “Rap 2 Bridge the Gap” initiative at MS 42 with Principle Finn to improve relations between the Police and the Community. Lt. Saleba spoke to students about the job of a Police officer and the dangerous they face daily on the mean streets. Students asked questions about getting arrested, gang life, drugs, bullying and how the Police and Community need to work closer to keep our schools and communities safe. Police solve most crimes with public support so it behooves both parties to work as a team to improve public safety because that is why Rap 2 Bridge The Gap was created. The event closed with the reading of the President’s Message and the creation of a committee who will draft a letter thanking the President for his kind words and request that he visit the school before the end of his term. Why must we End Gun & Gang Violence, address Black on Black Crime and Bridge the Communication Gap between the community and law enforcement agencies? 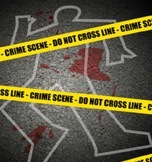 The Wall Street Journal reported a new crime wave after two-decades of decline. Some say the uptick in shootings is due to the “Ferguson Effect” a term coined by St Louis Police Chief Sam Dotson, whose officers drew back from daily enforcement due to fears of being charged. Also the former Attorney General’s Report on Ferguson put the actions of Police Departments nationwide on notice. 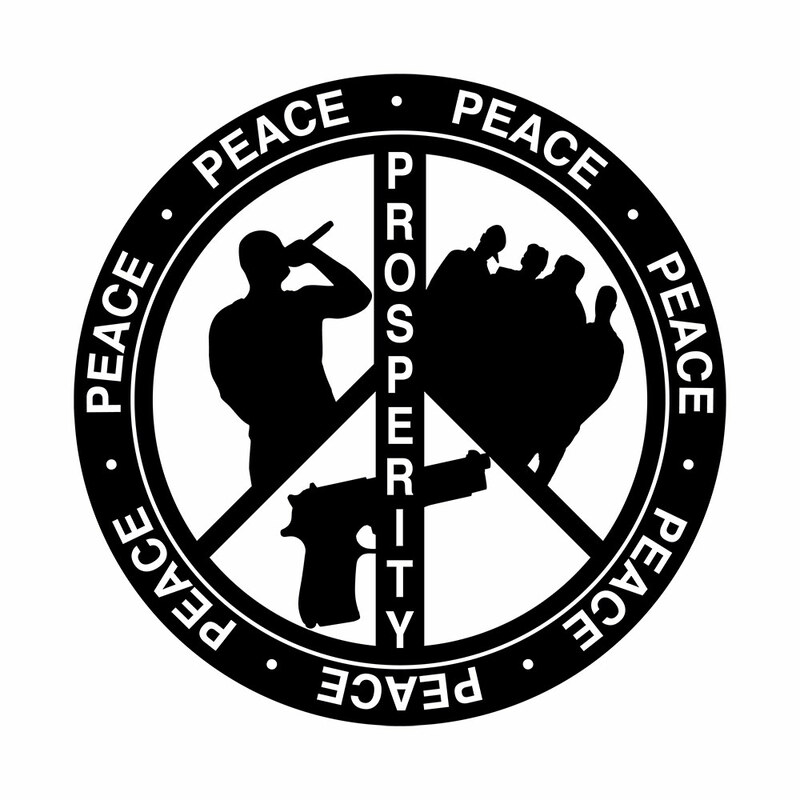 Poverty and illiteracy continue to be the “Root Causes” behind gun and gang violence and until we can solve those issues there will never be peace in our communities. Young people today are fearless, with no morals or values and like the Palestinian Bomber many believe they have nothing to loose. This is the “Frankstein” we created and we only have ourselves to blame. Arresting gang and street crew leaders is a temporary fix because there are many poor and at-risk youth in line ready to take their place. As we countdown our 105 day campaign which ends 9/7/15, we have a lot of work to do and with an “Inspirational Message” from President Obama, as well as support from the “My Brothers Keep Alliance”, our sponsors and elected officials, we can reach out to young citizens urging them to support our “Call To Action” and join the “Raptivism Movement” so we can make this a safer and better world. HHSYC and Ambassador Garcia at the signing of the historic MOU with FEPADE of El Salvador. HHSYC with Nassau County Executive Ed Mangano holding the 2015 HAGGV Proclamation. Written by Charles Fisher and Randy Fisher (Twitter / Facebook / Instagram @HHSYC).